It's simple interest. I meant to say computed instead of compounded. Every months Payment will be off of the initial Cost of the Car ? The payment is the same every month. It's the allocation of the payment toward the interest and toward the principal. As you make more payments the principal portion increases and the interest portion decreases. Thanks guys been great help.. It's simple interest as in: the interest charged is the CURRENT balance times the interest rate. Although the Annual Rate is 3%, the monthly rate is 0.25%. The monthly rate (0.25%) is the significant rate since payments are remitted monthly. In this situation, simple interest is the loan balance times 0.0025. If payments were made Annually, then the significant rate is the Annual Rate (3%). In this situation, simple interest is the loan balance times 0.03. This is where we start getting into the nuts and bolts of "the time value of money" , which is the basis of the equation presented earlier as well as the Excel formula, and it can get confusing. If you are interested in the nuts and bolts of "the time value of money", I recommend obtaining an Introduction to Finance book from your local library, or googling for youtube videos and other web resources to help explain it. The monthly payments are fixed and do not change. The monthly payment is a combination of interest and principal payments. As the interest payments decreases each month, the principal payments increases in the excat amount of the interest decrease. As you can see, the interest payment decreased from $11.25 to $10.95, a $0.30 difference. Since the monthly payment does not change, the $0.30 decrease in interest payments was added to the principal payment. Don't fret over the $0.01 difference as it will be made up in subsequent months due to rounding. Enter your loan data and scroll down to click on the amortization schedule. It will also show you how much you will save by making extra payments over the life of the loan. And now a plug for savings/investing. If you make the monthly deposits to YOUR savings account. You become the bank and get the BENEFIT of the interest. Understanding the power of the time value of money is the best lesson anyone can learn. Now with the power of computers and the internet anyone can do it. 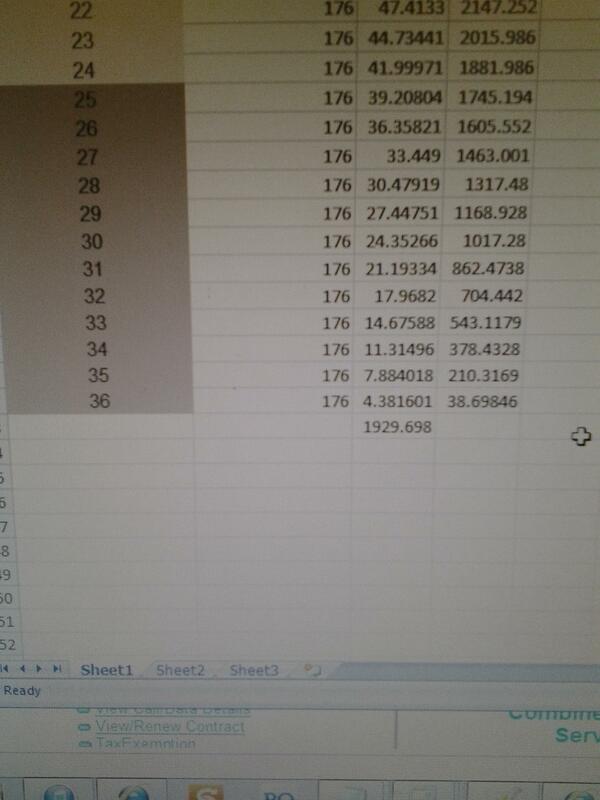 Back in the old days, we did all these calcs by hand. When I was taking tests as a Finance undergrad, we couldn't even use calculators. We did all the math by hand and had to be able to do a lot of it in our heads as the tests were all timed. This is where we start getting into the nuts and bolts of "the present value of money" , which is the basis of the equation presented earlier as well as the Excel formula, and it can get confusing. If you are interested in the nuts and bolts of "the present value of money", I recommend obtaining an Introduction to Finance book from your local library, or googling for youtube videos and other web resources to help explain it. I completely agree that everyone should attempt to learn the power of the time value of money. Learning the time value of money has been one of the most beneficial courses I've taken. And thank goodness for spreadsheets and financial calculators! An amortization table can be created to see how much of the monthly payments are applied towards interest charges. I tend to avoid amortization tables for auto loans. Instead, I use them for tracking mortgage payments. The Excel formula returns a $130.87 monthly payment. 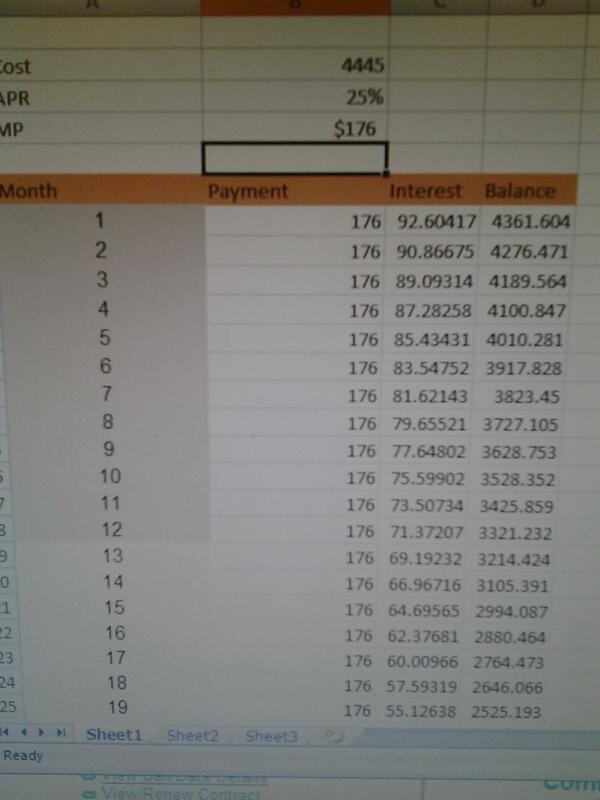 Keep in mind the $211.16 in interest is the MOST interest you will pay (assuming you do not re-finance). In other words, you're paying about $70 per year in interest, or $6 per month to borrow $4,500. * [note] Any additional payments to the principal will decrease the total interest paid. However, including additional payments ontop of the monthly payment requires an amortization table or further knowledge of the time value of money to manipulate the Excel formula to determine the total interest paid. The posts have helped a lot. Unfortunately, the minimum payment for $5000 @ 30% for 36 months is $212.26. Lenders will not allow you to make less than minimum payments without incurring a fee. In your scenario of only making $170 instead of $212.26, the loan will be paid off in 54 months.